At 54 million in 2013, Hispanics account for 17% of the U.S. population and are responsible for half the nation’s growth between 2000 and 2012. Much of this growth since 2000 has come from the births of Hispanics in the U.S. rather than the arrival of new immigrants. As a result, English use among Hispanic adults is on the rise. Today, about six-in-ten U.S. adult Hispanics (62%) speak English or are bilingual. One question this raises for the news media is to what degree this population turns to outlets dedicated to coverage – in both Spanish and English – presented through a Hispanic lens. 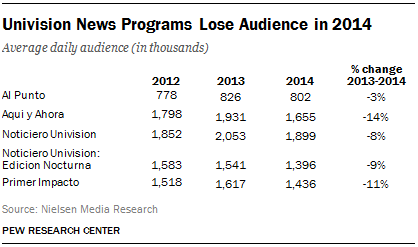 Audiences for news programs on Univision, the largest Spanish-language media company in the U.S, were down in 2014 compared with 2013 both at national and local levels, as was circulation among Spanish-language daily newspapers. 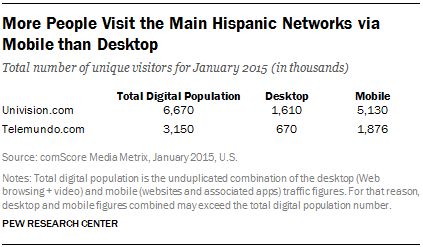 However, the news audience at Telemundo, the smaller Hispanic television network, grew in 2014. Newer, English-language players such as Fusion, Latin Post and the now defunct Voxxi are also emerging. It is still unclear, though, to what extent they will gain a foothold with their target audience: younger, English-speaking Hispanics. 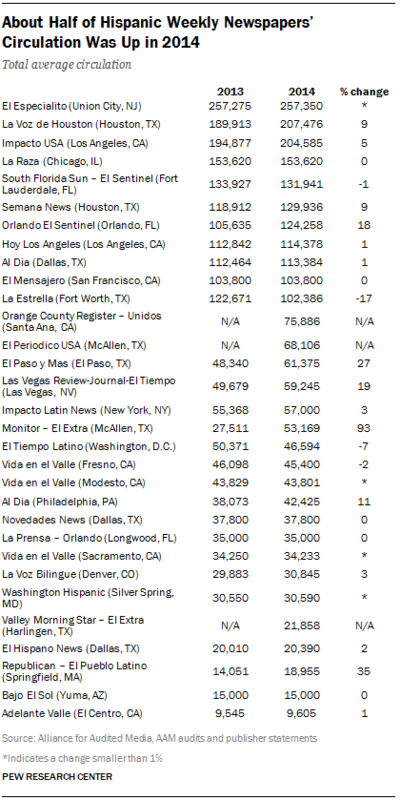 In 2014, three major long-standing Hispanic daily newspapers saw decreases in print circulation, according to data from the Alliance for Audited Media. 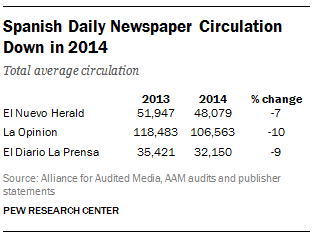 Miami’s El Nuevo Herald, which was founded in 1975, lost 7% of its circulation overall in 2014 compared with 2013. Los Angeles’ La Opinion, which is the largest daily Spanish-language newspaper in the U.S., had the greatest decline in circulation, at 10%. And circulation at El Diario La Prensa, a daily in New York City, dropped 9%. Pew Research Center also identified 31 weekly newspapers for which audited data are available. For the group, total circulation grew 4% in 2014. About half (17) enjoyed increases, eight were either stable or did not have trendable 2013 data, and six posted losses. 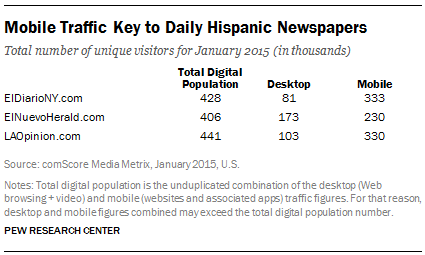 The total number of unique Web visitors for the three Hispanic dailies is considerably low, compared with the digital traffic at African-American newspapers. Nevertheless, they follow the broader trend of more website traffic coming from mobile devices than from desktop computers. Univision has come a long way since it began in 1962 as a single television station in San Antonio, Texas. Today, it is by far the largest Spanish-language media company in the U.S. when it comes to revenues, ratings and stations owned. But its news programs still trail most U.S. network newscasts – a gap that widened in 2014 as Univision’s news programs saw ratings fall from record highs in 2013. Univision’s half-hour evening newscast lost 8% of its audience in 2014, after enjoying an 11% growth the year before. Its early evening news show, Primer Impacto, fell 11% to 1.4 million daily viewers on average. And the Sunday nighttime news magazine Aquí y Ahora fared the worst, with a 14% decline to 1.9 million nightly viewers. By comparison, Sunday morning political show Al Punto saw a decline of just 3%. Rival Telemundo, by comparison, saw its news audience grow in 2014. The Sunday morning talk show Enfoque enjoyed the biggest increase (17%), totaling 181,000 viewers. The evening newscast Noticiero Telemundo was up 11% from the year before, averaging more than 800 thousand viewers. Still, this is less than half the audience that tunes in to Univision’s competing evening newscast. The early evening news show Al Rojo Vivo, which now airs one hour earlier than Univision’s Primer Impacto, increased its viewership by 11%. Despite declining news program ratings, Univision’s financial picture for 2014 was much brighter. 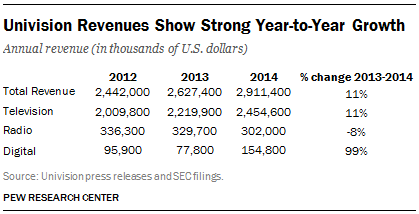 Overall, Univision’s total revenue grew 11% in 2014, from $2.6 billion to $2.9 billion. On-air television revenue, which accounts for the vast majority of the total and includes revenues from entertainment as well as news programs, grew 11% to 2.5 billion. Its digital properties, while just 5% of the total, nearly doubled year over year thanks in part to advertising revenue from the 2014 FIFA World Cup. Radio properties, on the other hand, experienced losses of 8%. Despite these gains, Univision still carries a sizable amount of debt ($9.2 billion), largely the results of the 2006 decision to take the company private and the 2007-2009 economic recession. In March 2015, Univision hired underwriters to lead an initial public offering, which is expected in the second half of the year. Telemundo’s revenues are not available for analysis, as its parent company, Comcast, does not provide network-specific revenues. In addition to its network programming, Univision owns and operates 61 affiliate stations across the U.S. Of those, 39 air evening and late night news, according to Nielsen. Average evening viewership was roughly stable from 2013-2014, while late night viewership declined 5% to 1.8 million. By comparison, ABC affiliates gathered an audience of 7 million on average for the same daypart. Just 11 Univision affiliates air local morning news, for which viewership was up a slight 1% to 215,000. The 30 local TV stations affiliated with Telemundo, on the other hand, enjoyed a stronger year. Morning viewership more than doubled in 2014, while early evening and late night newscasts saw double digit growth – 25% and 14%, respectively. Similar to at the network level, though, Telemundo’s audience is far smaller than Univision’s. During one of the most popular dayparts, 1.8 million people tune in to watch the late night newscast on Univision. 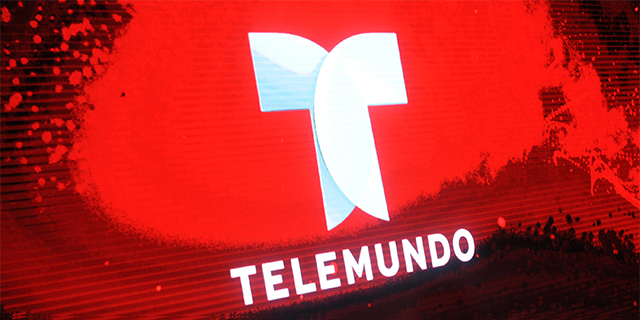 Telemundo, in contrast, averaged less than half of Univision’s audience – about 700,000 viewers for the same daypart. More than 500 radio stations that exist in the United States run on a Spanish-language format, but only 30 air news and talk programming. While listenership for those 30 is not available, researchers were able to gather revenue data. 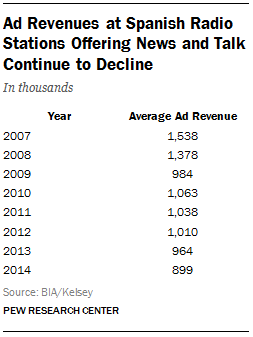 From 2013 to 2014, combined revenue for Spanish radio stations that air news was down 7% to about $900,000, according to BIA/Kelsey. The biggest loss (29%) since 2007 came during the recession, in 2009.